Protecting your feet while outdoors is obvious to most people, but not all of us see footwear in the home as a necessity. In-house footwear, whether it is slippers, sandals or shoes, can not only significantly improve your healing time with an injury, but also protect you from further discomfort. Much like outdoor footwear, not all shoes are created equally. When looking for footwear to be worn within the home, some of the same principles apply; look for structure, proper fit and appropriate materials/construction. Depending on your needs and personal history of injury, the features of your indoor footwear will vary. The basic guide below will help you choose indoor footwear that is right for you. For those with no history of foot problems, chronic diseases (such as Diabetes or Arthritis), or other issues, a soft-soled slipper may be sufficient to protect you feet in your home. Slippers can help protect from minor bumps, toe stubs and minor cuts/scrapes from foreign objects. In warmer months, sandals can provide similar protection, without the added warmth of slippers. If you have mild foot pain, minor issues or soft soled slippers simply are not giving you enough relief, there is an option that might serve you better. 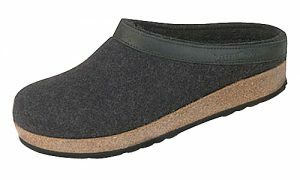 A supportive slipper, such as Haflinger, provides mild to moderate support built into their molded footbed. Another option is to choose a Birkenstock sandal or other molded-footbed sandal to wear indoors. These slippers and sandals provide good support and protection from minor injuries that can occur indoors. For those who currently wear custom foot orthotics or are having more serious symptoms in their feet, firm soled slippers with a removable footbed are an excellent option for supporting those steps you take indoors. There are a variety of options available, all varying in price, style and features. Two of our favourites are Foamtreads and Biotime. 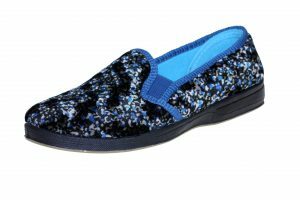 Both of these brands have a selection of styles, from a slip on mule to a fully enclosed shoe-style slipper. These brands make slippers with a removable footbed, so that you have the option of using your custom foot orthotics in your slippers as well. We encourage this option for our patients with more complex injuries, or for those who are having pain or discomfort in conventional slippers. One distinct advantage of enclosed, firm-soled slippers is the added protection that they provide for the foot. While they certainly are not steel-toed boots, enclosed slippers offer more protection from household hazards. In cases where more support is needed, we will sometimes recommend a shoe for indoor use, often to be combined with a custom foot orthotic. In these cases it is often one of the structural components of the shoe that are of paramount importance in your comfort or symptom relief. Few slippers and sandals provide a forefoot rocker, heel counter and firm shank. These three structural features are often a key component in successful treatment of foot and lower leg conditions. Your Pedorthist may recommend that your wear a shoe indoors if you have a chronic condition (such as Arthritis or Diabetes) or an injury that has stalled in recovery or is otherwise not progressing as quickly as intended. Shoes provide a stable environment for the orthotic to offload, correct or accommodate areas of concern. Shoes also provide an additional layer of protection in the house. 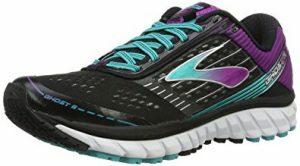 In complex cases, a specialty shoe may be required to heal from a traumatic injury, recovery post surgery or to provide relief from more severe complications of a chronic condition. “Speciality” is a broad term used to describe shoes with certain features that accommodate, offload or otherwise alter biomechanics of the foot or lower limb to assist in recovery or alleviate pain. Specialty shoes have features that accommodate for a wide variety of foot conditions. Extra depth, stretchy upper material and wide stable base of support are some of the most common features of specialty shoes. 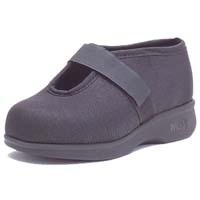 If your Pedorthist has recommended a special shoe, be sure to discuss the reasoning behind the recommendation with them so that you know exactly how and why this shoe is important in your care plan. In all cases, it is important to follow the guidelines that your Pedorthist has provided to you in order to optimize your comfort, recovery and/or general foot health when considering indoor footwear. Even healthy people could benefit from protecting their feet indoors. Tripping hazards or other household dangers such as broken glass can pose a significant risk to your feet. If you Pedorthist has recommended a specific shoe for use in the house, be sure to heed their advice. For more information at any time, contact us or visit out website for more information on footwear and foot care!